Since it's Saturday it's time for the Less is more Challenge. This week it's to use a Bird. I made a bunch of these cardinals from the Stampin' Up Bird Punch a while back. 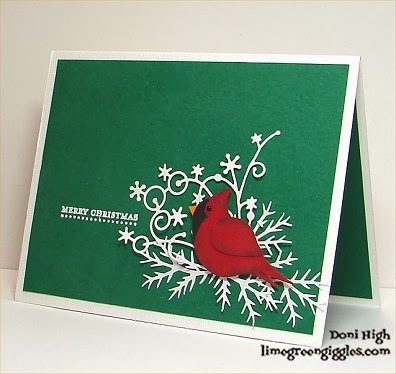 punched from the Martha Stewarts punch and put the cardinal on top then stamp the greeting. Yea! Another Christmas Card done! Just gorgeous, I love your cardinal! By the way, how did you make the crest? Did you use the wing section for it? Thanks for the info Doni, it was much appreciated! My favorite bird ever~ love it!! This is lovely. The bird and white boughs are very striking against the green background.